As army cutworm moths begin to migrate back to the plains in late summer and early fall, many grizzlies turn their attention to another high elevation food source ─ whitebark pine nuts. Whitebark pine is a widespread species that grows at the upper margin of the subalpine zone, up to treeline, in Yellowstone National Park and surrounding areas. 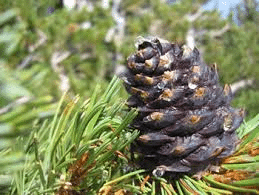 Whitebark pine trees often grow in vast, single-species stands and produce cones containing large, highly nutritious nuts. Cone production varies greatly from year to year, and occasionally drops to nearly zero. But in most years, especially high production years, whitebark pine nuts are heavily used by both grizzly and black bears. In years with poor whitebark pine production, conflicts between grizzlies and people typically increase as grizzlies move down from the high country to search for food in areas more heavily used by people. Many birds and mammals, such as Clark’s nutcrackers and red squirrels, eat and cache whitebark pine nuts. 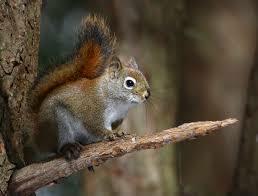 Red squirrels create especially large caches of whitebark pine nuts and cones. The large caches, termed middens, may be used for many years and may contain well more than 1,000 nut-bearing cones. Grizzlies and black bears often raid squirrel middens, stealing the seeds. Grizzlies may eat entire cones, but usually extract the prize nuts, maximizing nutrient intake per volume of material consumed. Whitebark pine stands are under siege from several agents in the Greater Yellowstone and the Rocky Mountains. Early in the 20th century, a non-native fungus, termed white pine blister rust, was accidentally introduced to North America from Europe. The fungus attacks and kills whitebark pines and close relatives. About 20 percent of whitebark pines in the Greater Yellowstone Ecosystem have been infected and killed by white pine blister rust, as the fungus has spread southward from Canada. Prolonged drought and warming temperatures have also impacted whitebark pines both directly and indirectly. These conditions contribute to increased frequency and intensity of wildfires, usually ignited by lightening. Wildfires have burned through large stands of whitebark pine, killing about 24 percent of existing trees during the summer of 1988 alone. In recent years, infestations by mountain pine beetles have killed huge numbers of whitebark pine trees. The pine bark beetle is a native species, coexisting for thousands of years with whitebark pine trees. However, cold winter temperatures have historically limited both the distribution and size of mountain pine beetle populations. Warmer winters in recent years have allowed beetle numbers to soar and extend their range in higher elevations. Compounding the effects of beetle infestation, drought conditions have reduced the moisture content of whitebark pines, so they are less capable of fending off beetle attacks.